Clover tools are always the best! The 1/4" bias taper maker is so easy to use & perfect for making the handles on our pink baskets. Clover article no.464/06. We love this glue for temporary basting of fabrics and wool when doing appliqué. The 1 fl. oz. glue is in an EZ-Squeeze bottle. The best thing about this glue is the fine tube tip that reaches well under the fabric and leaves the smallest bead of glue, holds firmly until moistened or washed. Water soluble, dries clear PH neutral. 18mm replacement blades for mini 18mm OLFA rotary cutter. 2 blades per pack. 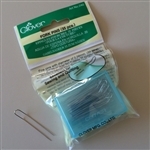 Clover Fork Pins are perfect for holding together multiple seams when piecing, quilting, sewing. 35 steel fork pins come in a small plastic box. Easy to use Fork Pins feature 2 pins in one. This is the Itty Bitty Primitive Gatherings Pinwheels tool needed to cut & twist the 2-1/2" squares used to make our Twister Jack small 14" x 15" quilt. The tool includes instructions and an additional small quilt pattern. This tool is the 2-1/4" Primitive Gatherings Pinwheels tool needed to cut & twist the 3-1/2" squares used to make our Twister Jack larger 24" x 26" quilt. Carol Doak's Foundation Paper - 100 sheets - 8-1/2" x 11"
Foundation Paper for Paper Piecing. Use in most inkjet or laser printers or copy machines. No shrinking, curling, or turning brittle. It's non-coated so your fabric won't slip on it. It's lightweight and won't create bulk when you join sections. This is the Marti Michelle Tumbler Template #8204 used to cut 3" finished Tumblers for our Tumblers Quilt Kit. The tool may be used to cut 8 different sizes of fiinished Tumblers: 2", 2-1/2", 3", 3-1/2", 4", 4-1/2", 5" and 5-1/2". The tool is also known as the "One-derful One-Patch Template". This is the TRIANGLER Template by Heather Peterson of Anka's Treasures used as a companion to quilts in Heather's ANGLES WITH EASE 2 quilt book and our Paperweights quilt kit. Clover's Magnetic Pin Caddy #4105 in color: Bordeaux ... comes with 10 silk pins. Center groove makes picking up pins from caddy easy. Size" 3" x 4". Includes cover for safe and easy storage & allows for stacking caddy. We show the pin caddy with Little House pins (our favorite pins ... pins not included). 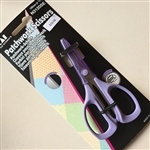 Fun Purple -- Great patchwork scissors with ergonomic soft handle/comfort fit 4-3/4" (120mm) scissors. Antique salt dips are the bases of our very special pincushions, hand made especially for us by our creative friend Candy Hargrove! A NEED'L LOVE EXCLUSIVE! Some of the pressed glass or cut glass salt dips are fancy with ribbed or fanned edges, some are tailored & others are footed. Sizes vary from 1-1/2" to 2" diameter. 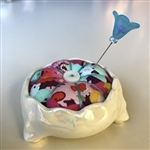 The darling antique sherbet dish is the base of our very special pincushion, hand made especially for us by our creative friend Candy Hargrove! A NEED'L LOVE EXCLUSIVE! 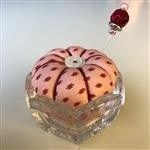 Pressed glass and footed, this sweet pincushion is approximately 4" in diameter 4" tall. Tall 5" English antique egg cup makes the base of our very special pincushion which appear to be a type of milkglass. 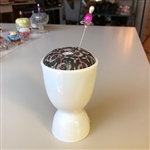 I've collected some very special egg cups to feature with a hand made pincushion created especially for us by our friend Candy Hargrove! A NEED'L LOVE EXCLUSIVE! 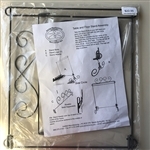 The Ackfeld wire Quilt Stand is easy to assemble & holds a 14" quilt. 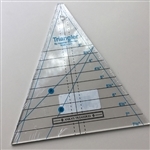 OMNIGRID RULER SET of 3 Rulers by Omnigrid #R2465 --- (1) Square Ruler 6-1/2" x 6-1/2" --- (1) Square Ruler 4-1/2" x 4-1/2" --- (1) Square Ruler 2-1/2" x 2-1/2"
Some of the pressed glass or cut glass salt dips are fancy with ribbed or fanned edges, some are tailored & others are footed. This is a special amber glass footed salt dip measuring 2-1/2" across the top. Unusual larger flower shaped master salt dip or ice cream dish. Antique salt dips are the bases of our very special pincushions, hand made especially for us by our creative friend Candy Hargrove! A NEED'L LOVE EXCLUSIVE! Some of the pressed glass or cut glass salt dips are fancy with ribbed or fanned edges, some are tailored & others are footed. 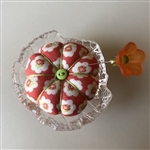 Sizes is 3" in diameter. VERY SPECIAL 3 FOOTED OPALESCENT GLASS SALT DIP! 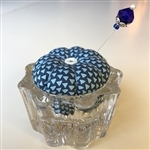 A child's darling glass rootbeer mug is the base of our very special pincushion, hand made especially for us by our creative friend Candy Hargrove! A NEED'L LOVE EXCLUSIVE! Some of the pressed glass or cut glass salt dips are fancy with ribbed or fanned edges, some are tailored & others are footed. 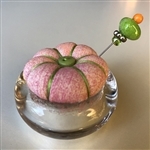 Sizes 1-1/2" diameter & 2" tall. 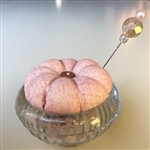 Unusual larger flower shaped master salt dip or ink well. 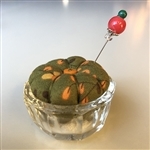 Antique salt dips are the bases of our very special pincushions, hand made especially for us by our creative friend Carol Box! A NEED'L LOVE EXCLUSIVE! Unusual Leaf shaped pressed-glass 3-footed salt dip. Sewing Machine LED Light Kit from Babb Enterprises. Includes LED Panel/Strip with On/Off Dimmer Switch, Power Adapter & 6 wire clips. Easily attaches to the back of your sewing machine for great lighting. 5 Year Warranty from Babb Enterprises.